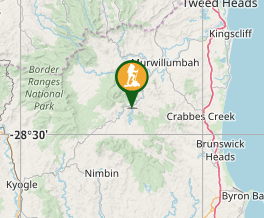 3.3km south west of Uki, NSW. Drive to the end of the paved Clarrie Hall Dam Rd, Uki NSW. Start at the end of the paved road. Nice walk, note that there is a controlled entry and the gate closes at either 5 or 6 depending on day light saving. A little hilly but a few nice view points along the way. Was a bit muddy due to recent rain. The end section to the final viewpoint (not part of the Dam Wall Trail) had knee high grass. Be cautious of snakes.